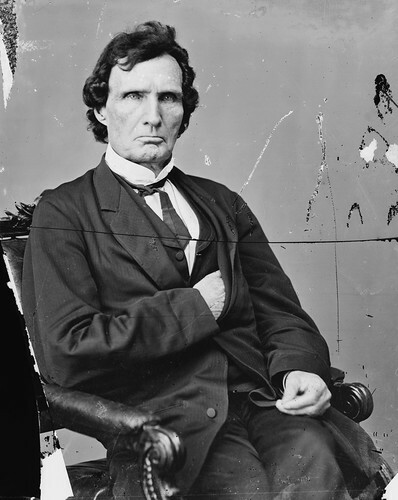 Thaddeus Stevens introduced a bill in Congress to abolish slavery as part of reconstruction. Eventually, of course, this required a Constitutional amendment. A bill introduced by Representative STEVENS today, and the consideration thereof postponed till February next, provides that within all the territory of the Confederate States which has been, or may be conquered and subdued by the National arms, all laws and parts of laws which permit Slavery are henceforth abolished, and that Slavery shall never again be established within said territory; that hereafter no portion of it shall be admitted into the Union as a State, or be represented in its Congress, excepting by delegates, if the same should be authorized, until the people within the territory forming such State shall by its organic law forever prohibit Slavery therein. This entry was posted in Abolitionism, Reconstruction, Slavery, Thaddeus Stevens. Bookmark the permalink.